I had to evacuate my house in Sonoma a few days ago, as did all my neighbors, when the fires pressed down upon us from Santa Rosa, which had already been horribly decimated – thousands of houses and businesses burnt to the ground. At that time we didn’t know about all the lost lives, just the wretched smell of smoke, the ash falling like heavy snow, and the police driving up and down the roads telling us how close to us the blaze was. Yet as of this writing there are over thirty confirmed deaths including a young teenager trying to outrun the fire on foot. This statement is true, but it’s also a kind of lie. What I discovered, what many of us did, was that the objects in our lives are also the “important thing”– these objects with which we surround ourselves – the art on our walls, our mother’s china, the photo from that hike in the Sierras, the plant we’ve been nursing for ten years, the love letters moldering in that old file box, the playbill from that first date – these in fact are the items by which we define ourselves. They are our connection to those whom we have loved or hated, those who gave us life or those who helped us along the way. Our journals, our cancelled checks, our collection of salt and pepper shakers – whatever it is that in our own lives mattered – this is also who we are. And when you have an hour or less to decide: what do I pack into the car – and you see how small the space is in your car – and you realize how little time you have to choose – a kind of Sophie’s Choice confronts you – which child lives, which is consigned to the flames – and you begin to have a sense that things also have a spiritual nature. Similar to friendship, love, faith and work. These things, they are also your identity, even the ones you’ve forgotten that when you look upon them remind you of who you were, where you were, what you said, to whom you said it – oh yes, that’s right, that happened! That was me. That is me. Your history. Your beginning. Your legacy. Your things. I’ve sometimes discounted the importance of things: after all, it’s just stuff. To all who are confronted with the horrible fire, and to all who can only watch and wait, stay safe. Stay strong. Okay, let me add my voice to the Sean Spicer yuck-o-rama. And here it is: Are you kidding me? This guy is a liar and a creep of the highest order, with not a shred of decency; a guy who helped pervert and undermine the highest office in the land. How amusing. I ask you, has Sean Spicer even apologized for what he did? Not to my knowledge. (Not that it would matter, to be honest). But why bother even thinking about the consequences of his actions? There are none! Let’s just move forward, shall we? It’s the right thing to do. Look, I think Stephen Colbert is great and he has been on point in his monologues for months now, but shame on him and his producers. Forgive and forget? You forgive someone when they make a sincere effort to change, when they at least try to undo the damage they’ve done. But, nah. Let’s just put him center stage in front of millions of viewers and call it a day. Because when you get right down to it, what so wrong with demeaning and demoralizing entire subgroups of this nation? What’s the big deal if you fabricate facts and support bigotry and hatred? It’s all showbiz! And Sean’s a good person, after all – even nicer than all those fine folks waving swastikas in Charlotte. We’re all human after all. Let’s not judge. Because what’s written between the lines is that, at least if you’re white and putatively Christian and in a certain income bracket, you can do or say pretty much anything you want without suffering one itty bitty little consequence. And that’s a pretty good deal, I think. If you want to live in hell. Until next time, Stay Safe & Be Kind! This week a friend of mine who just moved to Berkeley over in the East Bay discovered one of the true gems of the Bay Area art scene: the Berkeley Art Museum - Pacific Film Archive (BAMPFA). He was duly impressed, and I’d like to share with you some of the things he saw now that the building has finished its renovation and is now open to the public. The first exhibition you come to is called “Charles Howard: A Margin of Chaos.” I’ll be honest. Never heard of him. My bad. But maybe not: because one of the great things about being alive is that no matter how long you’re around or how savvy you think you are, there is always something new to discover. When you look at the photos of his work (below) you’ll see why I’m so excited and why I intend to hop over to Berkeley to catch this exhibit. My friend (as ignorant as I) lucked out because there was a free lecture given by the curator of the exhibit, Aspara DiQuinzio. 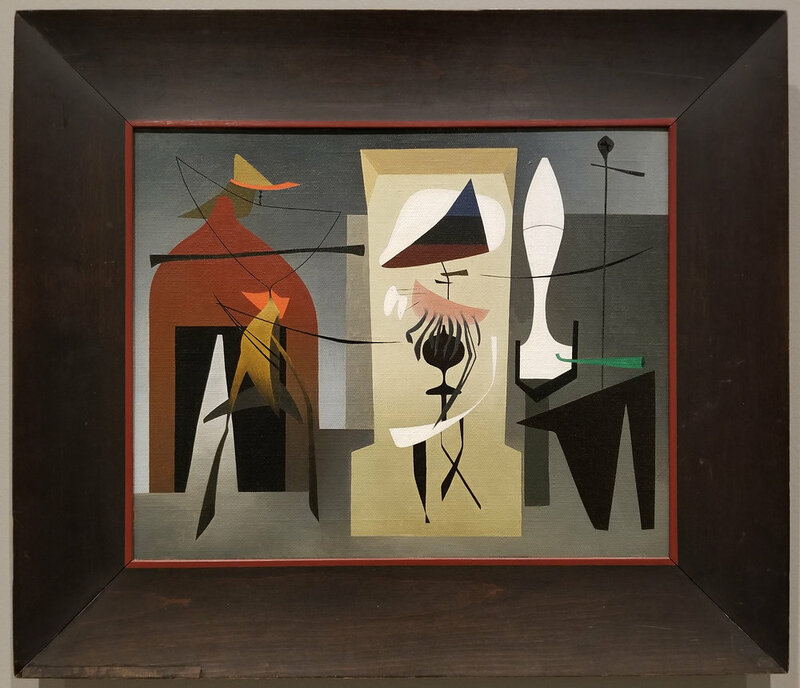 It turns out this is the first exhibition of Charles Howard’s in the U.S. since 1946. I love it when someone is rediscovered. Gives one hope! It turns out theHoward family was enormously influential in the development of the town of Berkeley. For instance, Charles’s father was the Head Architect for UC Berkeley for many years and was responsible for designing and overseeing the construction of some of the central structures and buildings that are still on the campus today. But most important is the power of art, its immediacy and transformative impact – no matter when you discover it, no matter the fame or obscurity of its creator, no matter the time or place you confront it. Although in this case, you can easily do it by getting yourself down to the newly remodeled Berkeley Art Museum. It’s at 2155 Center Street, just off of Oxford and about a block or two away from another fantastic East Bay wonderment – the Berkeley Rep theater. Stay safe! Have fun! Do art! As do most writers, I have a lot of friends who practice other arts – music, painting, theater, and in future blogs I’m going to tell you about some of these remarkable people and expose you to some great work you’ve probably never seen. 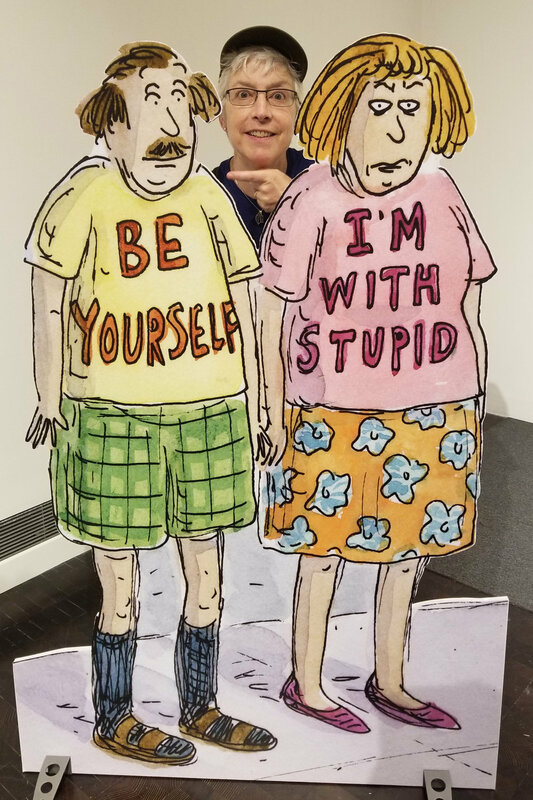 But first – I just have to share with you my experience seeing the Roz Chast show at the Jewish Contemporary Museum (CJM) in San Francisco. I’ve been a huge fan of hers for 20 years at least but only was able to enjoy her work in The New Yorker Magazine and some of her other publications – but never up close and personal. Truly one of the funniest commentators on contempory urban life, this was an experience not to be missed. So if you couldn’t make it SF I want you to get a little idea of what the exhibit was all about. Along another wall there was a strip dedicated to Chast’s book “Can’t We Talk About Something More Pleasant?” This graphic novel discusses Chast’s experience with end-of-life moments she shared with her parents. It is simultaneously dark and hilarious. Which is pretty much true of all her work, and some of mine as well. Anyone who has lost anyone – or who may lose someone (oh wait, that’s all of us) should read it. A couch placed in front of an illustrated wall where people could sit beneath thought/speech bubbles and emulate the characters in the illustration. 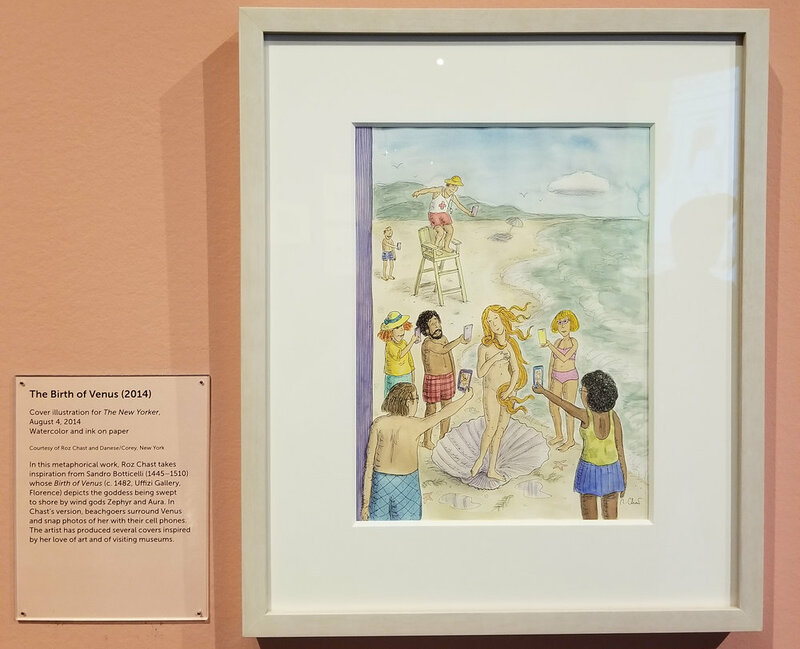 There were many more thought provoking and hysterical illustrations but unfortunately I couldn’t take pitcures of them all – but I hope you got a taste at least of the joy of seeing Roz Chast’s work up close and personal. And be sure to check back for the second round of my trip to the CJM when I’ll share some an incredible exhibit called “The 613” by Archie Rand and also, as promised, some insights from other artists and writers I’m lucky enought to know personally. Be well & stay safe to all! For most writers, setting – where you place your characters – is really just another character in the story. It’s the ground on which the action takes place, and if it’s real enough, if you get the details right, your human characters feel more real, allowing your imagination to take flight. In The Heart of Henry Quantum, San Francisco is as important an element as Henry or Daisy or Margaret. Maybe it’s even more important. The book is a love letter to that wonderful city and I worked very hard to get the it right. Setting drives emotion. Think about the different feel you get when a scene takes place in a gloomy back alley contrasted to a lovely tree-filled park, or a cramped office cubicle compared to a sun-filled loft. Now compare that to what you feel hurrying through a canyon of glass and concrete towers. You might feel awe and wonder at their sheer size, or you might feel quashed and isolated by their icy façades. It’s unlikely you’ll feel same as you did at that fountain in Rome. I recently listed to a fascinating TED talk by Justin Davidson, in which he discussed the seemingly ubiquitous epidemic of glass towers in cities. He made the point that glass has become the default wrapping material for most new high-rise buildings. Davidson suggested there are legitimate reasons for switching to glass. It’s cost effective, easy to construct, and easy to replace should something break. And most important from a consumer point of view is the ability to bring the outside world in: a major selling point for high-rise luxury apartments is the 360 degree surround-view from the 15th or 20th floor. Not bad if you can afford it. The challenge with glass, however, is that there is only so much range an architect can achieve in the external appearance of a building. Because of this, Davidson argued, many skylines of global cities are becoming homogenized. The simple designs required to sustain glass exteriors severely reduce diversity -- the very diversity that has drawn so many people to travel around the world to see new, different, and wonderful structures. In The Heart of Henry Quantum the texture of the buildings and neighborhoods Henry passes through gives textural significance to his life. So too are our lives enriched by the texture of the buildings that surround us. Do we want to revel in those spaces, as we might in the Roman plaza, or merely pass through as we might in the financial district of San Francisco? As Davidson points out, architecture is only one factor in how we use (or ignore or avoid) our public spaces. How often we look up from our phones is clearly another factor. But do take a few seconds now to indulge your senses in some of the remarkable buildings and spaces that Davidson shared in his talk. And perhaps ask yourself: What kind of buildings would I like to see in my city or town? And, how would being surrounded by buildings like these change my perception of the world around me – or, even, perhaps, my perception of self?